Poor Robie. Poor Edison. Poor Larry, since he’ll end up taking the blame for this one. 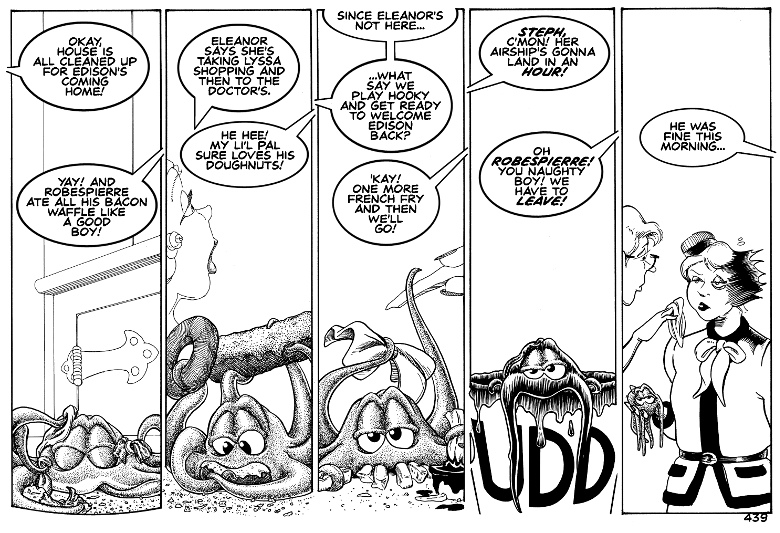 Big Groovy, Kinda thanks to melaredblu and hippo for this strip. We were talking about how long Groovy, Kinda takes with webcomic time, and we thought it’d be fun to run through most of a day in one strip. So we did. Oh that look on Edison’s face!!!!!! I have 5 nieces, 3 nephews, 10 great nieces and having ‘babysat’ most of them……….Yeah that T shirt fits! Poor Edison is not happy. She knew this wasn’t going to go smoothly, but she had no idea. I think being a parent helps me write stuff like this. I’ve been there a number of times myself. Aww, poor pudding face Edison. Take the cutest character and make everyone feel sick to their stomach. Nice going! Incidentally, what kind of mouth does Robie have? Is it a beak like a squid, a gaping pie-hole, or does he eat through osmosis? Science needs to know these things! I guess you could say Robie has a pie hole underneath. He can shape it to do different things, as Stephanie pointed out here. Is that the ‘Extra Chunky”? And she dressed so nice with hat and all. Poor Edison. I know. I wondered how she was going to be when she arrived. Did she drink heavily on the airship? Would she be plastered? Nope, she’s a lady. Only two drunk bubbles-which is about as sober as she gets-and a Chanel suit. She wanted to make a good impression, but it was Robie who stole the show. Ahaha, it’s so cool seeing how this page turned out! Robie is quite the little glutton, isn’t he? Is he rubbing himself with the bacon in panel one? I mean, I know bacon is tasty, but wow. And judging by the fact that her hair is blown back, I’m guessing Robie gives “projectile” vomiting a whole new meaning. Yech. He’s using napkins. He’s a glutton, all right, but a well groomed one. And as far as the projectile vomiting goes, I could’ve just drawn some recycled pudding on Edison’s Chanel dress, but hey, it’s a comic. At least he seems to keep his figure, despite all the overfeeding going on. Wait, what is even the ideal figure for a land based hexapod? That’s a very good question. As a nanobot collective, Robespierre doesn’t have fat cells. He could create some for energy storage, which would make him a little more…well rounded. But with all this food around, why bother? You can see how Stephanie loves to spoil him.